Since the invention of clocks, astronomers have secretly wished for a clockwork universe. Believers in gods "making" things love the idea of the "eternal clock maker" who sets everything into circular motion. The universe is much stranger and unruly than any clock. The closer we look, the more unruly it looks. The temptation to view space as pretty stationary is very strong simply because since the first homo erectus looked up at the night's starry vault and thought, nothing ever changes there, unlike here! For many generations, humans watched the stars and imagined they were eternal and steady. Only they weren't, not from earth! The shifting of the stars vis a vis the horizon over the course of centuries troubled humans the more they studied this, the more a certain dread and unease arose. The North Star shifted, too! Skipping merrily from Vega to Draco to the present North Star, this steady guide to the vast migratory movements of humans following game or transient resources proved to be more like a drunk, wandering about the skies. Of course, the planets wandered in a much wilder way and much quicker. These things troubled the sleep of our ancestors and even today, the desire to pin everything down once and for all is a strong impulse that scientists even feel. The relative universe as seen by Einstein opened the doors to viewing the universe as this dynamic system with all things moving in various ways relative to each other. We now think our own solar system is plowing along in one of the further spiral arms of the Milky Way, we move at our own speed and other entities move at their own speeds, some passing us by, others moving away from us. One wonders if our solar system, this fragile conglamoration of various rotating, spinning objects and their host star, has been for the last couple of billions of years, one lucky ducky! There are so many hazards around us, unstable stars, clouds of debris or gases, lurking black holes trying to lure other stars into their gravitational death grip. Our sun has managed to avoid so many terminal fates! It is interesting that the envelope that holds much of the dangerous junk away from us, the solar winds pushing much of it away except for lots of fragments that drop into the sun's gravitational pool, showing up as meteors and comets, is not circular but oblong or misshapen in some fashion. (CNN) -- The Voyager I spacecraft has moved into the solar system's final frontier, a vast area where the sun's influence gives way to interstellar space, NASA's Web site reports. "Voyager has entered the final lap on its race to the edge of interstellar space, as it begins exploring the solar system's final frontier," said Edward Stone, Voyager project scientist at the California Institute of Technology in Pasadena, in a statement on the Web site Tuesday. 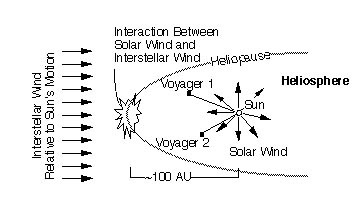 At 8.7 billion miles from the sun, Voyager I has entered the heliosheath, a region beyond termination shock -- the critical boundary that marks the transition from the solar system into interstellar space. Contrary to popular belief, space is not an empty void. Rather, the solar system is awash in solar wind, charged gases that flow off the sun at supersonic speed. The wind travels at an average speed ranging from 300 to 700 kilometers per second (700,000 to 1.5 million mph). At the termination shock boundary, the solar wind dissipates and begins to give way to the interstellar medium -- the gases that float in the void between stars. Space isn't merely filled with gases, when one is in the grip of the gravitational pool of some large black hole complex, there is a lot of dirty, dark stuff which we know very little about and you can bet, if we ever get close to any of these masses of whatevers, they will amaze and surprize us hugely and overturn any previous ideas we concoct for explaining what they are. The galaxy we inhabit is a pretty crowded place, the closer one moves to the center if one follows the flow of an arm, the more crowded it gets. 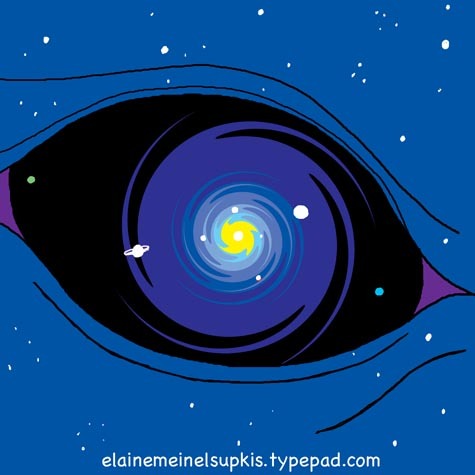 If one could travel away from a black hole's lair, after passing the "termination shock boundry" which is the spiral arms, I bet it really is "empty" for the most part. In contrast to our socially isolated sun, here is a young star cluster, the famous Plieades. Faint reflection nebulosity -- starlight shining off grains of interstellar dust -- extends far from the `Seven Sisters' in the center of the cluster. This mosaic of 40 visible-light images was taken with the 0.6-meter (24-inch) Burrell Schmidt telescope at Kitt Peak National Observatory, near Tucson, Arizona. Here is a mosaic image of the fast moving star cluster. It is surrounded by hot gases. The stars are much brighter than our yellowish sun, they are less than 100 million years old, an eyeblink in time to our old sun. They are less stable than our reliable old sun. Why is our sun not part of such a conglamoration? If we look closely at some of the stars in Orion, it is the same story, lots of gases, dust, maybe big, big rocks, tremendous explosions, rapidly evolving stars, chaos in general as the forces pull apart and jam together whatever has been trapped in these systems. We know very little. If we were to fly to Orion's belt, we would see things that would boggle the mind. It is most lucky for us that our system is rather predictible, staid, quiet and small. Like a little mouse dodging the trampling feet of giant dinosaurs, our star glides along, unnoticed by the vigilant giants, scurring along the outer edges of the spiral arms, all we can hope is this doesn't change. Just keep rewinding that clock, whoever is running this show!